ON THIS DATE (April 21, 1994) ... The Oakland Athletics were shocked like most of the crowd of 28,032 that saw Boston score two runs in the ninth inning for a 6-5 victory. 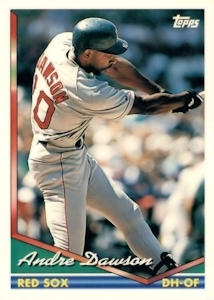 The Red Sox pulled it out with clutch hitting by Scott Cooper, Andre Dawson and Otis Nixon. It wasn't just base hits, but the spectacular and dramatic manner in which each hit occurred. The single was by Cooper, normally a born lumberjack on the basepaths. He was the definite aggressor, and when Ruben Sierra bobbled the ball in right, Cooper made it to second, just under Scott Hemond's tag. Then came Dawson, hobbling badly on a sore right hamstring. With the poise of a classic veteran, he jumped on a high slider for a run-scoring double off loser Dennis Eckersley. With the score tied, it was left to Nixon, known more for his running than for his bat, to provide the winning blow. His double on a 1-1 pitch stunned the A's. Nixon pulled an Eckersley slider just inside first base for his third hit of the day. Not bad for one who started the afternoon on an 0-for-21 slide. The Eck has been bad before, but this was a nightmare he didn't expect. Many thought Cooper was crazy for what he did with one out in the ninth. He knew after an incident in the sixth inning, the A's might take him for granted. They did and paid a price.